Sometimes all the hard work of jelly making results in set failure. While this can be a frustrating setback, it does not mean the end of a jar of jam or jelly. Fix the jam by re-cooking it, or give it new life as a sauce or topping by letting it remain a bit thin. Either way, don't waste the fruits of your labor, but instead enjoy them in the fullest. Jelly may fail to set for several reasons. Jelly is made of four components -- fruit, sugar, acid and pectin. In order for these components to mix and gel, a hard boil is required for about one minute. If a jelly does not set, it is likely that one of its key elements is missing or it was not properly boiled. Measuring fruit, sugar and pectin exactly is key to a good set, as is a rolling boil. This means that the jelly is boiling so hard that it cannot be stirred down. If all of these steps are completed, the jelly should set. If not, you can fix the problem in a few steps. To determine if you have set failure, wait until all jars are cool. Some jellies may take up to 48 hours to gel, so do not rush to fix the jelly if it is not thickened within a day. Instead, leave the jelly on the counter at room temperature. When 48 hours has passed, turn the jars upside down and see how long it takes for the jelly to move. If it is completely liquid, this is surely set failure. Even if it holds a bit, you may wish to fix the jelly to create a more spreadable one. If one jar fails this test, it is likely that all of the jars in a batch will fail as well. You will need to re-cook the jelly to fix it. 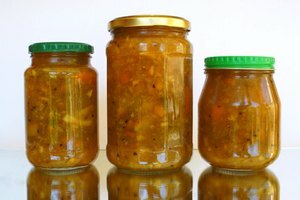 To do this, open all of the jars and pour the contents into a large pot. Keep track of the volume of jelly, writing it down as you go for accuracy. Wash the jars and prepare them and new lids for canning. Bring the jelly to a boil over high heat. For each quart of jelly, whisk in 1 tablespoon of pectin and stir constantly until the jam appears to thicken slightly. Test the set using a plate test, a method that uses a chilled plate to quickly bring the temperature of the jelly down and determine its set. Once the desired thickness is achieved, fill the jars, seal them with new lids and the same bands and process them for 10 minutes in a boiling water bath. Sometimes you simply don't want to go through the hassle of re-cooking jelly. This is a great time to experiment with different uses for runny jelly. It makes a perfect syrup in most cases, able to give a fruity punch to waffles or pancakes. Whisk a tablespoon or two of powdered sugar into it to make a glaze for sweet breads or donuts. 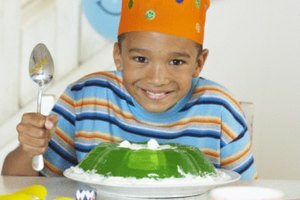 Runny jelly can also be used as a topping for ice cream or baked fruit to give it a sweeter, more dynamic edge. 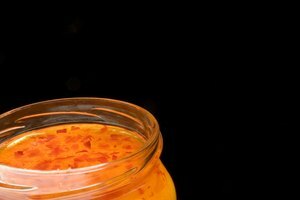 Pomona Pectin: My Jam or Jelly Didn't Jell - Can I Fix It?